Webster's defines a rivalry as "competition for the same objective or for superiority in the same field." That means Tom Brady and Peyton Manning have a rivalry. A phenomenal one, actually. And yet, it doesn't feel like one. Throw in "Who Shot Ya?" and "Hit 'Em Up," and it becomes clear: Brady and Manning couldn't surpass those guys unless they played a quadruple-overtime postseason game, then fought to the death in the shower afterward. I don't know. Tame? Benevolent? Manufactured? They could never surpass Ali and Frazier; the mutual bitterness isn't there. They could never trump Bird and Magic; those guys practically grew up trying to beat each other. They could never match what happened between Russell and Chamberlain from 1959 to 1969, have a moment as compelling as Borg and McEnroe's Battle of 1816, despise one another as much as Shaq and Kobe, capture a generational shift like Palmer and Nicklaus or resonate like Mays and Mantle during the days when America cared about baseball and little else. Brady and Manning also like one another -- a lot -- to the point that it's not worth asking one about the other. When I called Brady this week to pick his brain for a few minutes, the mere mention of Manning's name had Brady gushing. That's just how quarterbacks are wired. You never hear them snipe at a rival or grumble about the credentials of a teammate who took their job. (Only after they retire does the possibility of an Esiason-Marino incident come into play.) It's the single hardest job in sports, and the only people who totally understand that are quarterbacks themselves. They pull for each other. All the time. When Bernard Pollard ended Brady's 2008 season after eight minutes, a shaken Manning called him to check in. When Brady's surgically repaired knee developed a staph infection a few weeks later, he remembered Manning battling a similar issue and called his foe for advice, saying later, "He was very encouraging. He always has been. He's just that kind of a guy, a very classy guy." I don't remember hearing that lyric in "Hit 'Em Up." we all kinda look around and admire the other guys because you realize how much of a challenge [playing quarterback] is. I look at Peyton and think, 'Man, I wish I could do the things he does.' I look at Drew Brees, same thing. Or Aaron Rodgers. Anyone. When you play those guys, you aren't buddies, of course -- you WANT to beat them. Any other time, that connection is gonna be there." CHECKPOINT No. 1: Two former friends turned mortal archrivals. Don't get hung up on this one. Even if it happens in sports from time to time -- most famously when Ali turned on Frazier before their first fight, when Shaq and Kobe turned on each other in 2003, and when Ricky Vaughn and Roger Dorn feuded on the 1989 Indians -- not every significant rivalry needs a nasty edge. Besides, Bird and Magic are practically brothers at this point. Does that affect how we remember their rivalry? Would it have felt more substantial if Bird had rapped "Tell Me How My A-- Tastes" during Boston's 1984 championship parade? Of course not. Even if it would have been the highlight of my life. Harry How/Getty Images Brady showed a burst of emotion after scoring against the Colts in a playoff victory in January 2005. CHECKPOINT No. 2: Two fundamentally different people who grew up in different ways, had different life experiences and just seemed different in every way. Here's where the Brady-Manning clash gains momentum. One grew up in the South; the other grew up in Northern California. One was picked first overall; the other was picked 199th. One looks like a bouncer; the other looks like a movie star. One has been considered the best at every level since high school; the other had to repeatedly fight to prove he belonged. For years, one was considered "the talented guy who can't come through when it matters;" the other was considered "the overachiever who always comes through when it matters." One embraced his celebrity and enjoyed it, making goofy commercials, parodying himself in sketches and cultivating an image as a relatable Southern guy; the other morphed into an actual celebrity, dating actresses and supermodels, moving to New York and then California, gracing various magazine covers, sponsoring watches and boots, and becoming famous for playing football and for being famous. If there's an enduring snapshot of each guy, it's their postgame news conferences: Brady impeccably dressed and coiffed, looking like he has to bolt in a second because he's headed for a photo shoot; Manning standing there with that swollen, red helmet blotch on his forehead, looking like he's about to be whisked away to the hospital for X-rays. At first glance, you'd assume Brady was the No. 1 overall pick who had been anointed as "The Next Great Quarterback" since he was 15 and Manning was the one picked 199th who had to fight for everything. Nope. CHECKPOINT No. 3: Two of the greatest in their field, not just at the time, but ever. When the NFL Network counted down the 100 best NFL players of all time, Manning finished eighth (third for QBs) and Brady 21st (seventh for QBs). The voting happened last spring, well before Brady revived his prime with a stupendous 2010 regular season: 14 wins, 3,900 passing yards and a 9-to-1 TD-INT ratio (the old record, also owned by Brady, was 6.25-to-1) despite a ramshackle supporting cast of two former practice squad backs, two rookie tight ends, a slot receiver eight months removed from major knee surgery and a No. 1 target whose previous team basically gave him away in Week 6. Now he's favored to win the Super Bowl -- his fourth ring overall, if it happens -- which would easily vault him into the top 10 of that same countdown. Not that those rankings matter; Brady didn't even know about them. "I don't like being reflective," he says. "I feel like I'm at the midpoint of my career; whatever people say in the future, I don't care. What I feel the best about is winning a football game. That's it." • Barring injury, Manning will own the career records for passing yards, touchdown passes and completions by 2015 at the latest. Once Chris Ivory and Pierre Thomas were scratched, that left the Saints with Reggie Bush and Julius Jones ... which would be fine if it were 2006. Can they protect a double-digit lead without a quality running game? And can you really lay double digits with a banged-up southern dome team playing outdoors, on the West Coast, in the league's loudest football stadium? Actually, you can. Covering a double-digit line isn't THAT daunting. The 12 2010 playoff teams won 131 games; a whopping 55 of them (42 percent) came by 11-plus points. If you're worried about laying 10½, imagine backing this lousy Seattle team, then being stuck with Matt Hasselbeck trailing by 14 and getting blitzed to smithereens ... with Drew Brees standing on the other sideline. No thanks. Besides, Playoff Manifesto rules say that you can't pick a playoff team to cover unless you also believe it can win. I don't think Seattle can win. This reminds me of the Ravens-Patriots blowout last January: Some picked the Patriots solely because of Brady and Belichick, and unfortunately, reputations don't win playoff games. As we found out. Saying "you can't bet against Manning at night" isn't good enough anymore. His team stinks. They have two ends who can rush the passer, two receivers who can get deep and that's about it. Meanwhile, the Jets spent the offseason building their roster for this game specifically -- if they blow it, they'd be remembered as the biggest collection of frauds and posers in recent New York sports history. And this is a city that has the Mets. Because Baltimore looks so damned obvious in this one, I may have drifted toward the Chiefs if not for (A) coaching dissension (I hate distractions come playoff time); (B) Dwayne Bowe's health (by all accounts, iffy); (C) the way Oakland's front seven manhandled them last Sunday (a thorough whupping); and (D) their 2010 schedule of creampuffs, which is mindboggling if you stare at it long enough. Do you realize they played Carolina seven times? Fine, it just seemed like it. I can't see the Chiefs hanging unless it's one of those goofy "Flacco throws a red-zone pick, McGahee coughs up a goal-line fumble, McCluster breaks a kickoff, Charles breaks a 75-yard run"-type games. Besides, doesn't a Round 2 with Jets-Patriots and Ravens-Steelers feel almost preordained? I like Rodgers a little more than Vick. That's really it. Everything else feels like a crapshoot: two banged-up teams, two explosive passing offenses, two teams that wear green and love to commit dumb penalties, two coaches capable of a perplexing decision at any given time. That brings me to my one bold prediction for the weekend: Who better to break our virginity with the new overtime rules than Andy Reid and Mike McCarthy? Doesn't it have to play out that way? Throwing those semi-confusing overtime rules at Reid and McCarthy is going to be like cramming a hunk of peanut butter on the roof of a dog's mouth. I can't wait. • Only 23 quarterbacks have thrown at least 225 touchdowns in the regular season. Of those 23, only Brady has a TD-INT ratio better than 2.5-to-1 (261 TDs, 103 INTs). Only three others had a ratio of 2-to-1 or better for their careers: Steve Young (232 TDs, 107 INTs), Manning (399 TDs, 198 INTs) and Donovan McNabb (230 TDs, 115 INTs). • Manning has been named to 11 Pro Bowls (including 10 straight), tying him with Favre for the "most Pro Bowl selections for a QB" record. Merlin Olsen and Bruce Matthews hold the overall record with 14. If and when Manning breaks that record, think about the significance: being named one of the six best quarterbacks in football, year after year, for more than a decade and a half straight. These are the 10 best quarterback seasons ever by conventional metrics (passing yards, touchdowns/interceptions, yards per attempt, QB rating and wins), with just a dash of in-the-moment resonance thrown in. Notice No. 1 and No. 2. 1. 2007 Brady (16 G): 4,806 yards, 50 TDs, 8 INTs, 9.4 YPA, 117.2 rating, 16 wins. 2. 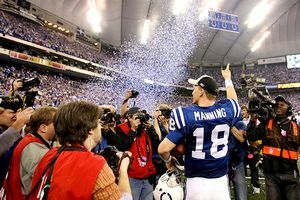 2004 Manning (16 G): 4,557 yards, 49 TDs, 10 INTs, 9.2 YPA, 121.1 rating, 12 wins. 3. 1984 Marino (16 G): 5,084 yards, 48 TDs, 17 INTs, 9.0 YPA, 108.9 rating, 14 wins. 4. 1999 Warner (16 G): 4,830 yards, 41 TDs, 13 INTs, 8.7 YPA, 109.2 rating, 13 wins. 5. 1994 Young (15 G): 3,969 yards, 35 TDs, 10 INTs, 8.6 YPA, 112.8 rating, 13 wins. 6. 2010 Brady (16 G): 3,900 yards, 36 TDs, 4 INTs, 7.9 YPA, 111.0 rating, 14 wins. 7. 1998 Cunningham (14 G): 3,704 yards, 34 TDs, 10 INTs, 106.0 rating, 13 wins. 8. 2009 Brees (15 G): 4,388 yards, 34 TDs, 11 INTs, 8.5 YPA, 109.6 rating, 13 wins. 9. 2009 Favre (16 G): 4,202 yards, 33 TDs, 7 INTs, 7.9 YPA, 107.2 rating, 12 wins. 10. 1989 Montana (13 G): 3,521 yards, 26 TDs, 8 INTs, 9.1 YPA, 112.4 rating, 11 wins. CHECKPOINT No. 4: Two unique skill sets that lent themselves to separate "Which skill should you value more?" and "Who had the better career?" arguments that can keep going for the rest of eternity. Press pause on the "Who had the better career?" question until about 2017. As for their skill sets, Brady and Manning are more similar than you'd think: hypercompetitive, durable leaders who outwork their teammates, set the standard for everyone else, adjust to any defense or situation, make other guys better and read defenses easily enough that they can't be game-planned. (On my podcast Monday, Mike Lombardi claimed Brady reads coverages so spectacularly that sometimes, if a defensive back falls down, Brady won't notice the open receiver because he already has processed the coverage and the receiver wasn't supposed to be open, so he knew not to waste his time looking there. That's crazy.) With someone that good running the show, you're guaranteed 10 wins no matter how heavily the odds are stacked against you, like Brady's 2006 season (when he came within a third-and-3 conversion of making the Super Bowl with no running game and a CFL-caliber receiving crew) or Manning's just-concluded 2010 season (when he willed the banged-up, depleted, secretly-not-that-talented-anymore Colts to a 3-seed). it's all done perfectly, effortlessly, and his unfailing consistency pressures opponents much like Faldo wore down Greg Norman back in the day. and once these guys catch fire, you can practically see smoke billowing from their heads. Lately, Manning has shown a touch of Mickelson's infamous sloppiness as well, throwing just 39 picks from 2003 through 2006, then 59 picks from 2007 through 2010. That enabled Brady's career QB rating (95.2) to leapfrog Manning's rating (94.9), which seemed inconceivable as recently as two years ago. To be continued. CHECKPOINT No. 5: A few seminal moments that directly affected the rivalry. Tom Brady and the Patriots have won eight of the 12 games with Peyton Manning's Colts. The QB rating for each player in their head-to-head matchups. Brady has beaten Manning eight of 12 times (see chart). Half of those games were memorable enough that either Pats or Colts fans (and in some cases, both) recall them by a specific phrase: the "Goal-Line Stand Game" (in 2003, in which the Pats prevailed with a goal-line stand in Indy); the "Four-Pick Game" (the 2003 AFC championship, in which the Patriots forced four Manning turnovers, also known in New England as the "Game Bill Polian Whined About Afterward Because We Beat Up His Receivers Like The [Bleeps] They Were"); the "Cut That Meat Game" (Round 2 in 2004, in which New England held Indy's offense to three points in a snowstorm as Patriots fans delightedly chanted "Cut That Meat," mocking one of Manning's commercials); the "40-Point Game" (in 2005, in which Indy finally beat Brady by exploding for 40 in Foxborough on a Monday night); "The Comeback" (in which Manning roared back from 18 down to beat New England for the 2006 AFC title, also known in New England as the "We Had It" game); and "Fourth-And-2" (in 2009, an implausible Colts comeback win that inspired a 4,000-word rant from me). 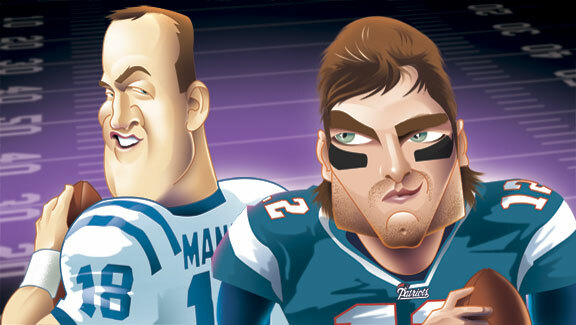 Put it this way: The NFL Network could run a Brady-Manning marathon that could kill your whole weekend. CHECKPOINT No. 6: Twists and turns throughout the rivalry, with both players grabbing the upper hand. Here's where "Brady versus Manning" goes to another level. How many rivalries saw someone grab the upper hand six times (and counting)? 1999-2002: Manning. By a landslide. Even after Brady's improbable Super Bowl victory over the Rams. UPPER HAND: MANNING. then squandered it when his Colts choked at home to Pittsburgh. UPPER HAND: BRADY. Mike Ehrmann/Getty Images Manning finally beat the Patriots in the 2006 AFC championship game and went on to win his only Super Bowl. 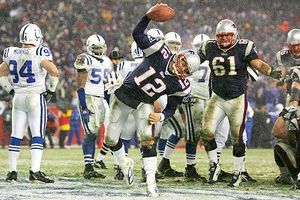 2006: Another shift: Brady dragged a particularly weak supporting cast to the AFC title game and a signature playoff victory (a Round 2 stunner against favored San Diego), then jumped to a 21-3 lead in Indy before Manning scored 32 second-half points to steal the game. Two weeks later, Rex Grossman won Manning a Super Bowl. I mean, Manning won the Super Bowl. So much for the Manning-Wilt parallels. UPPER HAND: MANNING. 2007: The Patriots made good for screwing Brady the previous season (with the Deion Branch trade) by importing Randy Moss, Wes Welker and Donte Stallworth, triggering the most dominant offensive season of all time: 589 points, 50 passing touchdowns and 18 straight wins. You know the rest. I feel sick. UPPER HAND: BRADY. 2008-09: Two words: Bernard Pollard. Five words: I feel even more sick. UPPER HAND: MANNING. 2010: By February, everyone had moved on to "Manning versus Brees" and Brady had become something of an afterthought. When I asked this week whether that bothered him, Brady laughed and said, "I didn't even notice. Everyone follows the teams that are winning; I can understand that. I'm sure our team was pretty much put on the backburner." All right, but did it bother him that some people wondered whether he had peaked as an elite player? "I don't ever really think about that stuff, to tell you the truth," Brady answered. "I know how I feel; I know the reasons why I'm playing well or not playing well. It never goes through my mind that my best days could be behind me. I think my best days are ahead of me, actually. I still think I can get better. My knowledge of the game, understanding the offense, understanding my teammates and how I can make them better, delivering the ball, all that stuff can always be better. This year, we're doing stuff as a team that we've never done before. And a lot of it's worked out. That doesn't mean you'll win 14 games every year, of course, but you can always get better." And he did. So where do we stand? How many twists and turns are left? A possible parallel: From 1979 through '86, Larry Bird had a better career than Magic Johnson. Magic caught up to him in 1987 and '88, then maintained his excellence from 1989 through '91 because Bird's body fell apart and Magic had a better supporting cast. Those last three years swung the rivalry permanently in Magic's favor: If you were starting a team, you'd rather have Magic for 12 transcendent years than Bird for nine transcendent years, then four injury-ravaged ones. That's why I ranked Magic one spot higher than Bird in my NBA book. Even if it damn near killed me. who, by the way, just won their past six games by a combined 158 points. I'd tell you more, but I'm still on probation back home for jinxing Super Bowl 42 with an admittedly premature column that my editors steadfastly refuse to expunge from my archives. or else. The Patriots rebuilt on the fly; the Colts need to do the same. Or Manning-Brady might head in the same direction Bird-Magic did. CHECKPOINT No. 7: A rivalry so good that it killed them both. We can safely rule this out. If anything, Brady-Manning is the complete opposite of Tupac-Biggie, and not just for obvious reasons like "posses," "jail time," "number of John Singleton movies made" and "denied involvements in shootings." Instead of measuring themselves against each other, the rigors of their job allow them to measure themselves only against themselves. Brady (and I'm sure Manning, too) takes it one day at a time, throws himself into the smaller pictures (never the big one), refuses to dwell on games that already happened and thinks only about what's next. Brady's favorite story happened when he was playing at Michigan: Someone asked equipment manager John Falk which of his championship rings was his favorite -- between Big Ten titles and national titles, Falk had something like 14 at that point -- and Falk quickly responded, "The next one." Brady loved that. He steals it whenever someone asks him, "What was your favorite Super Bowl?" "It's not about what you've done," he said. "It's about the process and journey of what you've accomplished, the gratification you get from it, and what you learned from it. After that, it's over. And it's time for the next one. That's how you have to think." 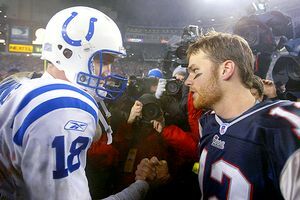 Ezra Shaw/Getty Images Even back in 2004, Brady and Manning were shaking hands after the Patriots won the AFC title. it never ends. They always have their scrubs on. Recently, Brady watched six hours of 2010 game footage of himself just to see whether he could catch anything. Am I tipping anything off? Could my footwork be better? Are my mechanics slipping in any way? Even if he noticed one barely perceptible flaw, that six hours was worth spending. Brady believes he's better in 2010 than in 2007 and that he will be better in 2012 than he is now, because he committed to that day-to-day grind years ago. Even if he can still list every quarterback taken ahead of him, falling to No. 199 doesn't motivate him like it once did. He learned from it, used it and moved on. "Being someone that many teams passed over," he explained, "there was a reason for it, you know? They didn't think I was a very good player, and they were probably right. I wasn't doing a good enough job listening to my coaches, I wasn't working at it hard enough, I wasn't good enough. Going 199th, it forces you to be critical of yourself. That ends up being the best thing for you." Maybe that's why, within a few days of last January's Baltimore thrashing -- normally a time when star players are licking their wounds on a tropical beach -- Brady was working out so maniacally that a friend looked at him in disbelief, genuinely concerned, and said, "Buddy, you gotta slow down." Brady wasn't working that hard to catch Peyton Manning; he was doing it to remain Tom Brady. Big difference. Every day when something isn't happening is a lost day. Every day serves a smaller purpose for a larger goal -- a goal that can never officially be enjoyed, because, instantly, it becomes about the ensuing goal. For Brady and Manning, it never ends. That's what makes them great. Which raises the question: If the rivalry doesn't matter to them, does it even matter? Sure it does. It matters to us. We're the reason networks produce countdown shows, and talking heads spend Monday mornings anointing new heroes and burying old ones. We're the ones who remember this stuff, care about it, cultivate it, pass the memories along to our kids, use those moments to define various points of our lives. Athletes don't think like fans; they think like athletes. They want to win, they love competing, they want to make money, they don't want to give up what they have. It's that simple. We have the luxury of assessing things from a distance. They do not. Got a question for Bill's next mailbag? Click here to send it in. Me: "I was there in '81 for Game 7." Cheeks (squinting): "Was that the year we won?" Me: "No, that was the year we came back from 3-1." Cheeks: "Didn't we win a Game 7 in Boston, though?" Me: "Yeah, in '82. The next year." Cheeks (shaking his head): "Man, all those games blend together for me." Blend together? BLEND TOGETHER????? I wanted to scream, "Hey, Mo Cheeks, the 1981 Eastern Conference finals was the single greatest basketball series ever played and a defining moment of my childhood. I remember what I WORE to Game 7. YOU CANNOT TELL ME ALL OF THOSE GAMES BLEND TOGETHER FOR YOU!" But I didn't. And not just because he's a good guy, and because it would have been weird. The truth is, it was Mo Cheeks' job to play in those games, just like it was our job to remember them. And just like it's our job to create fake rivalries between Tom Brady and Peyton Manning. This month, Brady is favored to win his fourth ring, while Manning is barely favored to make it out of Round 1. Unless their paths cross in the AFC title game, we shouldn't measure Manning by what happens to Brady, and vice-versa, only we can't help it. This is what we do. We are fans. Either Manning has to be better than Brady, or Brady has to be better than Manning. But there has to be an answer. There has to. "I certainly don't think about it," Tom Brady says. Bill Simmons is a columnist for ESPN.com and the author of the recent New York Times No. 1 best-seller "The Book of Basketball," now out in paperback with new material and a revised Hall of Fame Pyramid. For every Simmons column and podcast, check out Sports Guy's World or the B.S. Report page. Follow him on Twitter at http://twitter.com/sportsguy33.